A few days before POTUS, president Barack Hussein Obama graced his homeland, Cable News Network (CNN) which is a leading news TV channel described Kenya as ‘ a hotbed of terror,’ something that annoyed Kenyans, especially KOT (Kenyans On twitter) who immediately hit back with a hash tag that went viral, #someonetellcnn. You might think that it was a small issue but you were wrong. After Barack Obama’s maiden visit to Kenya, the government of Kenya decided to ‘peacefully part ways’ with CNN international. It even went further to withdraw an advertising deal it had struck with the giant news network. On Thursday, CNN’s global Executive Vice President and Managing Director, Tony Maddox flew from Atlanta into Nairobi, Kenya to apologize. 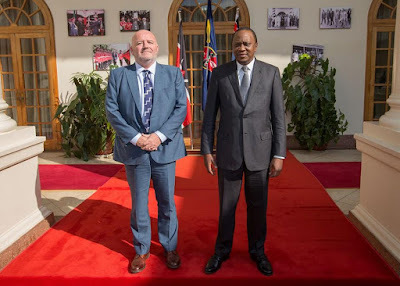 He met President Uhuru Kenyatta in State House to offer his apology. I hope Tony Maddox was sincere with his apology, Kenyans are enemies of impunity.